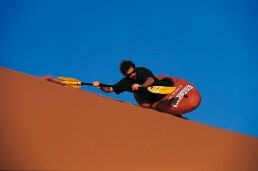 Shaun is a ground-breaking extreme kayaker and holder of 5 official Guinness World Records: "World Freefall Kayak" record a pure vertical drop of 19.7 metres; two "World Speed Altitude Descent" records over heights of 75ft and 50 metres; and his recently achieved "Kayak Land Speed Record - Snow". 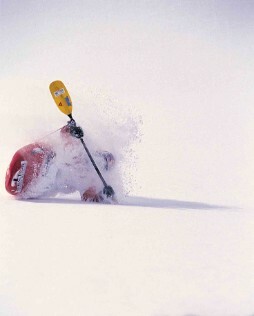 He has also clocked up in excess of twenty first descents of major waterfalls and whitewater rivers worldwide. 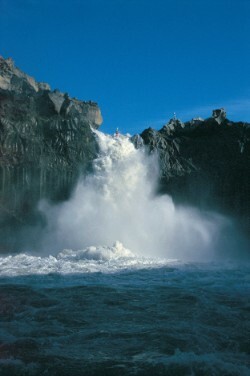 These include some of the largest falls in Iceland and the Alps, one of which has now been named "Shaun Baker Falls". Amazingly he started tackling these falls using, at the time, the world's smallest plastic whitewater kayak: only 2.2m in lenght (7ft 2in). Despite his obvious passion for the extreme, he is also drawn to the competitive art of Whitewater Freestyle Kayaking (he has won the UK National Championships 9 times) and continues to organize one of the world's largest annual whitewater events... on a River Thames weir near London! "SAS Thames Weir Rodeo/Hurley Rodeo". Shaun began kayaking aged 10, when his parents bought him his first kayak in an attempt to control his obvious obsession with water. Six years later, he led an expedition, with school friend Nick Mallabar, from Kingussie in Scotland to Hell's Mouth in North Wales. A major undertaking for two sixteen-year-old school boys, they paddled 700 miles down gnarly whitewater rivers and around some of the UK's roughest and most extreme coastline. Ten more years of ground-breaking exploits ensued, until one winter, Shaun and Nick completed another wild expedition around the treacherous north coast of Scotland. This time they paddled a new type of tiny plastic kayak designed for use in swimming poos -the paddling world thought they were mad, but despite numerous epics, they proved it could be done. In 1986, in one of his first major waterfalls challenges, Shaun, and fellow kayaker Fred Wondre, plunged over the previously unconquered Swalow Falls in North Wales. 1987 saw him establish a new Guinness World Record for "Freefall Waterfall Kayaking" at 15 m pure vertical drop - a height that in 1996, in a dramatic first descent, he was to push to 19.7 m. The rest, as they say, is history. 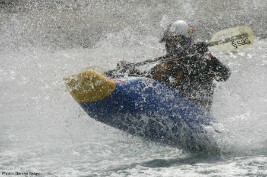 It is not solely the high-risk aspect of kayaking in which Shaun has excelled. He holds advanced level British Canoe Union Instructor and Examiner status in all disciplines of the sport, including life saving. Shaun also has a keen interest in the safety aspect of kayaking and is a leading designer of kayaks and whitewater safety equipment. Shaun has designed or modified most of the specialist clothing he wears, as well as the kayak he uses. Shaun spends an increasing amount of time gaining publicity for his sport and is regularly featured in films and magazines around the world. He recently taught Jack Osbourne to kayak over a waterfall in New Zealand, and raced on BBC's "Top Gear" against Richard Hammond (driving a TVR-powered Land Rover) in his Jet Powered Kayak - he won of course! Having won whitewater competitions from Japan to London, the competitive side of Shaun's kayaking proves beyond doubt that he is not just a madman attempting the impossible, but is in fact probably the most skilled and competent extreme kayaker in the world.